As businesses become more transportable and business men and women travel around the globe, using a digital cell phone service simply isn’t adequate. Many times people have to travel to remote areas or places where service is simply not available for their cell phone. The service systems which don’t run into this problem and can always count on having communication service any where at all time is providence. After 9/11 one can realize how a stringent activity can turn the world upside down and leave us with the feeling of how vulnerable we can be. When the twin towers were hit the landline and cellular systems in New York where overloaded or disrupted. People in New York had a difficult time calling out to family and friends to let them know they where OK. People calling into New York had problems getting through because most of the circuits where busy. After this terrible act of terrorism numerous government agencies realize it was necessary to have emergency back up communications in the form, which do not rely on local phone systems. Communication is defined as exchange of thoughts, messages, or information, as by speech, signals, writing, or behavior. A telephone that transmits and receives from satellites that provides coverage around the world. Over eighty percent of the land on earth plus any body of water (we're talking oceans here) is without sufficient landline connection, depending on the architecture of a particular system, coverage may include the entire Earth, or only specific regions. With a satellite phone we are able to communicate with anyone with a phone number from almost anywhere. The sat phone more closely resembles our portable home phone or one of those clunky cell phones from fifteen years ago “Iridium was the first satellite phone company”. An actual satellite phone can also be referred to by professionals in the satellite service field as a terminal or ‘earth station’. Some satellite phones can be chunky and reminiscent of the type of cell phones that were used in the 1980’s, but not all are made that way. Satellite phone shapes and sizes are changing much in the same way that digital phones have over the past decade. These are popular on expeditions into remote areas where terrestrial cellular service is unavailable. A fixed installation, such as used shipboard, may include large, rugged, 9rack-mounted electronics, and a steer able microwave antenna on the mast that automatically tracks the overhead satellites. There are only two ways to hook up two telephones in different parts of the world: they can be connected by a cable which runs on the surface of the earth and under the sea, or they can be connected by radio. Not every place on the earth is served by a cable connection to the Public Switched Telephone Network (PSTN), and thus some locations must either have no telephone service or be connected to the PSTN by a radio link. Modern cellular phones in the industrial countries mostly work in the cities and on the major highways. This is because each cell is a radio link from the cell phone to the PSTN; and if a cell phone user is located where there are no cells, there is no service. Because the earth is round, and because most radio waves travel in straight lines, it is not possible to form a direct radio link to a telephone or a gateway to the PSTN which is located over the horizon. An exception to this rule are the low frequency bands which can follow the curvature of the earth, but these frequencies were all allocated for other purposes decades ago and are not generally available for telephone service. Also it is possible to have a line of radio relay stations that stretch along the earth, but these are only practical for a large number of circuits carried by the PSTN. They play a similar role to the surface cables of the PSTN and are not generally available to individual subscribers. Almost all of the world-wide telephone voice traffic is currently carried by surface and under-sea cables. This has now changed because satellite phones have now become operational. Differences between ordinary communication and the satellite phone communication is it involves the other towers for the sake of the communication it they are ot available the network fails but as the satellite phones does not have no intermediate towers so communication link rarely get breaked. Globalstar, Inmarsat, Iridium and Thuraya. GLOBALSTAR: This satellite service plans were specifically designed to meet the needs of those who travel extensively. Consequently, they designed a phone that is a compact, tri-band handset that is able to operate on both the cellular CDMA and AMPS networks as well as the Globalstar network that consists of 48 low earth orbiting satellites. The benefit for those who take advantage of Globalstar plans is that the phones were created to switch smoothly between the cellular networks and the satellite network even while the phone is in use. Whenever possible, a Globalstar satellite phone will only use the cellular networks and switch to satellite only when they aren’t available. This offers customers the most cost effective satellite service available. INMARSET: It was the first mobile satellite system conceptualized and brought to reality. Inmarset originally designed their satellite phones for the maritime industry, but they now offer phone service to a wide range of industries. Inmarset uses four geo-stationary satellites set at different locations over the equator. IRIDIUM: This is probably the most recognized name in the satellite service industry. Iridium openly went bankrupt just one year after they launched their service. Motorola intervened, paid Iridium’s debts, re-launched satellite service in 2001 and has been providing successful service since. Iridium uses 66 satellites that orbit the earth on six different planes. Each individual Iridium satellite is able to orbit the earth once every 100 minutes. This arrangement allows Iridium to make sure that any Iridium handset can receive and make satellite phone calls from anywhere on the planet. THURAYA: It allows us to switch between the satellite system and the GSM system. The Thuraya service can roam on the local cellular network by replacing the Thuraya SIM card with a local prepaid SIM card. On the local network you are charged the local rates and not the Thuraya roaming rates. Thuraya satellite phones are capable of Internet connectivity, and data is available at no extra charge. Thuraya covers entire Europe and then Middle East, parts of India, Asia, and Africa. Even though it is called a "phone", the satellite phone is in actuality a radio transmitter. It sends signals directly to a satellite (part of a network of satellites.). When you turn on your satellite phone the signal goes up to any number of satellites in a compatible constellation where it is then registered with the constellation. Those signals are then sent back to earth to a station. 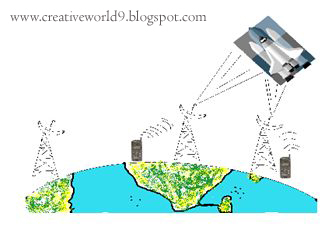 The Gateway(earth station) processes and takes care of the switching of the calls rather than the satellite network. This station then directs the call to the Public Switched Telephone Network (PSTN) or to a cellular network. If you are calling from a cell or wired phone to a satellite phone, the system works in reverse. Or think of a satellite phone calling another satellite phone. The signal goes up to the satellite, down to earth, back up to a satellite and then back down to earth again. The frequency specification of a satellite phone is 626.5 to 1660.5 Mhz for transmitter and 1525.0 to 1559.0 MHz for receiver. With most satellite communication devices we need Line-of-Sight to the satellite we are communicating with which include GPS devices, satellite TV, satellite Internet, satellite modems, hand held satellite phones and fixed site satellite phones. When using a hand held satellite phone we need at least 80% view of the sky to receive good service or we must use an external antenna with an 80% view of the sky. The success in making calls would depend on where the satellites are positioned at the moment the phone is used. Globalstar and Iridium both have LEO Low Earth Orbiting satellites. If we have a very limited view of the sky when using a satellite phone and have no service we eventually would have line-of-sight with one of the satellites orbiting the earth. Globalstar uses a constellation of 48 satellites that orbit the central hemisphere of the earth covering over 120 countries. Globalstar uses the technology which uses path diversity. Path diversity allows the Globalstar phone to be linked to as many as four satellites at one time. This technology prevents dropped calls when the line of sight is blocked to one of the satellites. The call is sent from the satellite down to the ground station and is then delivered to its call destination by land-line. If the user of the Globalstar phone is calling another Globalstar phone the call goes down to the ground station then back up the constellation then down to the other Globalstar phone. With the hand held phone there is an option of a car kit or docking station which includes a low provide magnetic external antenna witch allow line-of-site to the satellites while using the phone in a vehicle. GlobalCom offers a number of the Globalstar fixed site units which includes an external antenna that can be placed outside the building or vehicle. With the Globalstar fixed site phones we can have a number of (off the shelf) desktop or cordless phones tied into the unit. After installation the phones work just like a land-line phone with a dial tone. Iridium uses a constellation of 66 satellites that orbit the poles they travel from pole to pole and give coverage virtually everywhere on the planet which includes all the oceans and land masses. One of the way the Iridium phone can offer planetary coverage by taking the call and handing it off from satellite to satellite and then down to the closes Iridium ground station which the call is then sent to its call destination by land-line. If the user of the Iridium phone is calling another Iridium phone then the call is totally handled by the satellite constellation and is not sent to the gateway. Iridium does have optional portable and mast external antennas available. A LEO telephones utilizes LEO (low Earth orbit) satellite technology. This includes provision of worldwide wireless coverage with no gaps. Newer satellite phones tend to be LEOs. LEO satellites orbit the earth at high speed, low altitude orbits with an orbital time of 70–90 minutes, an altitude of 640 to 1120 kilometers (400 to 700 miles), and provide coverage cells. Since the satellites are not geosynchronous, they must fly complete orbits and thus further guarantee complete coverage over every area by at least one satellite at all times. Blimps are being considered as an alternative to satellites. Ø Tracking the data transmitted is impossible. Ø This communication does not rely on land line systems. Ø Towers on the Earth are not required. Ø It is highly useful in rescue operations at the times of disasters. Ø It is also used by the deep sea vessels for communication. Ø The phones are mostly used by the confidential system of any nation. DELAY: A disadvantage of a satellite phone is a noticeable delay in conversations. The signal must first travel to the satellite, then to an earthbound gateway before being routed to the receiver. The receiver's response will follow the same path in reverse, taking equally long to reach the caller. Satellite minutes are also more expensive than cellular minutes. BANDWIDTH: Another downside of the satellite phone is the limitations of bandwidth. Some satellite phones use a narrow band, sending along our audio signal, but they cannot handle the high bandwidth information at near the speeds we find at home. AFFORDABILITY: The cost at which the service is being provided is high. That is the call charge per minute is approximately Rs. 92.00, which is quite annoying..
Globalstar has plans in the future to send their satellite signal over terrestrial cellular towers allowing the signal to penetrate obstructions like building and vehicles. 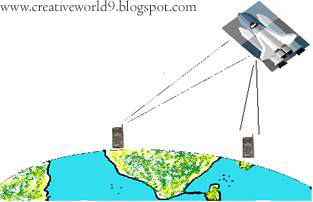 The phone would be in terrestrial mode when line-of-site to the satellite was obstructed then when line-of-site to the satellite constellation could be obtained then the phone would switch to satellite mode. The satellite communication industry is a growing field that is ever changing. As the technology develops humans will enjoy additional services never before offered.